Yesterday, Yaadvinder Singh was brought to court in shackles before the Sub-Divisional Magistrates court. He has been charged under section 107/51, a preventative measure for breach of peace. ANSWER: His crime is being the son of Gurdeep Singh Bathinda, one of the main organisers of Bapu Surat Singh’s Sangharsh Committee, who have been pursuing all peaceful means and methods, including talks with the state government, to release Sikh political prisoners languishing in India’s jails. 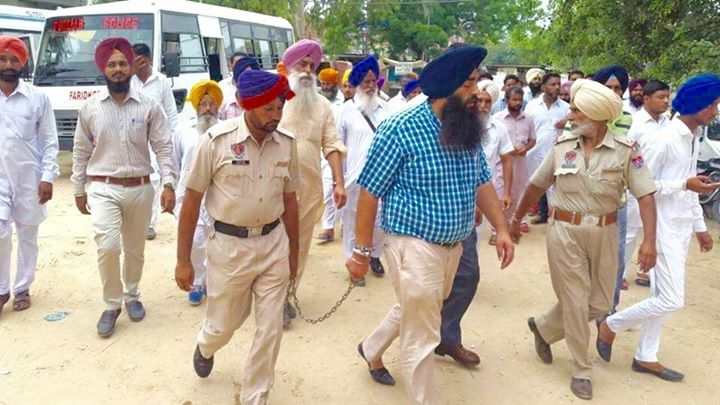 An innocent and law abiding citizen of India, shackled and imprisoned, Yaadvinder Singh was again returned to his prison cell until 3rd August 2015, while his father Gurdeep Singh Bathinda is also under arrest and being given the same treatment. Instead of releasing those who have already been wrongfully held for many decades, the state continues to increase the numbers of innocent Sikhs behind bars. September 1, 1604 The First Prakash Purab of Shri Guru Granth Sahib Ji.